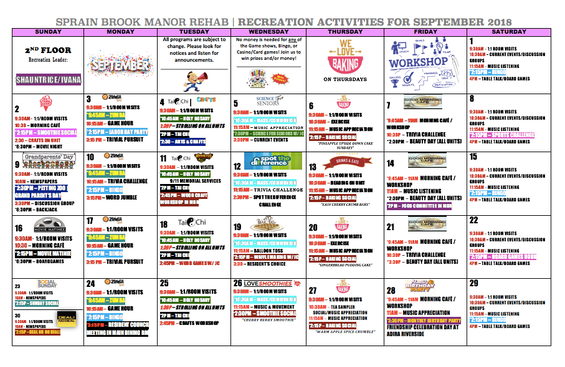 At Sprain Brook Manor, we provide personalized service and do our best to keep life at Sprain as engaging and interesting as possible. That includes our activities program. JC, our Director of Recreation, and his team, provide a rich program that differs from floor to floor. Our 121 bed facility is filled with a diverse population who hail from various cultures, religions and backgrounds, therefore we offer programs that have a wide range of appeal. 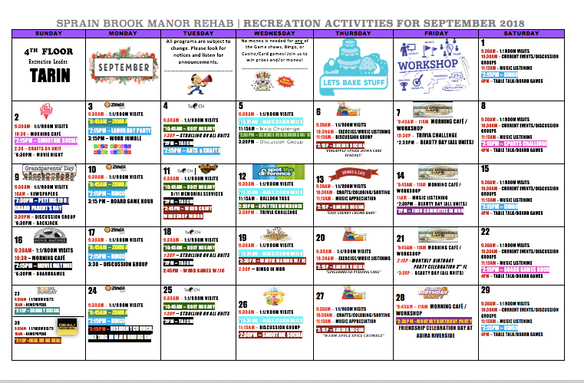 JC and his team put together a different calendar of activities for each of our patient and resident floors. Our second floor, which offers 40 beds, is for our short-term rehab patients. Many of these activities take place in our main dining room on the first floor of the facility but will sometimes take place in the 2nd floor day room. Our third floor, which holds 41 beds, is a locked unit for our dementia and Alzheimers patients. This calendar is specifically designed for memory impaired adults. 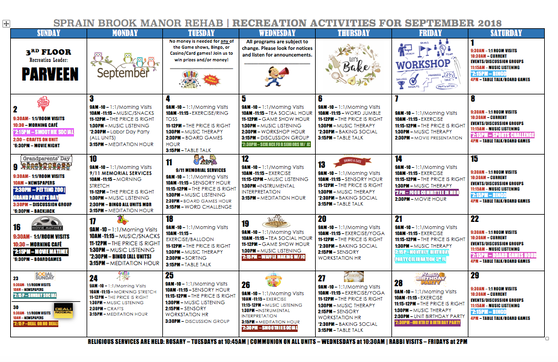 Our 4th floor is our long-term, nursing care population and these full-time residents call Sprain Brook Manor home.